Check out our advanced and powerful features. 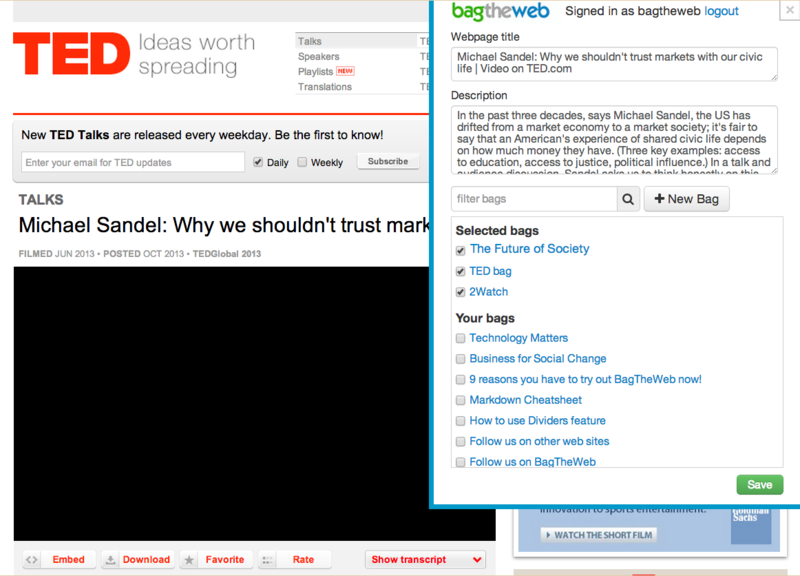 Our Chrome extension and Bag it bookmarklet for Firefox and other browsers makes it easy to add weblink items and existing bags into your own bags. Our Bag It tool supports multi-bagging allowing you to insert a single item into multiple bags. From TED.com to Wikipedia. 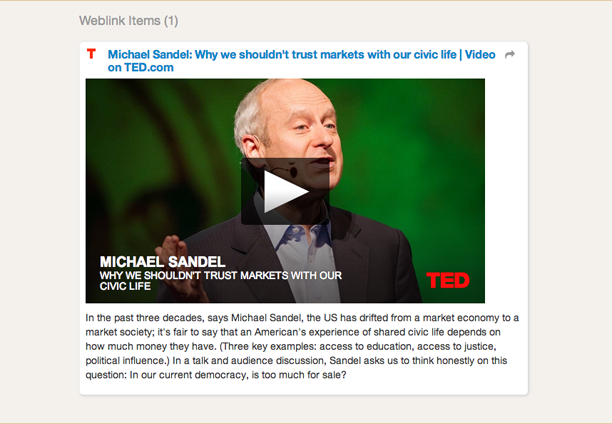 From Youtube to Slideshare. All you need to do is add a link to a bag and the rich media content will be recognized automatically and embed into the bag. Check out the list of sites we are supporting now. By using dividers, you can easily organize web items you bagged inside bags into sections to fit your needs. Check out this bag to learn more about the dividers feature. The bag is a mix of curation and creation. Can’t find what you want on the web? 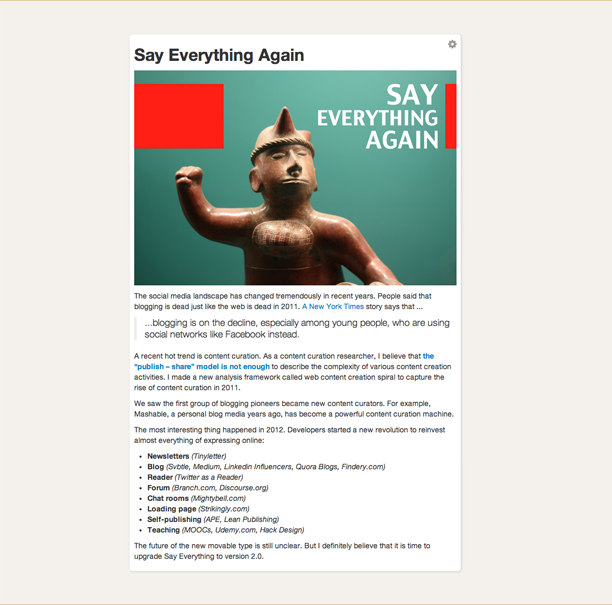 Use blurbs to insert your own content when the web doesn’t deliver. Check out this bag to learn more about the Markdown format. Share your bags with your site’s readers using our embeds. We offer four embed sizes to suit your content needs. 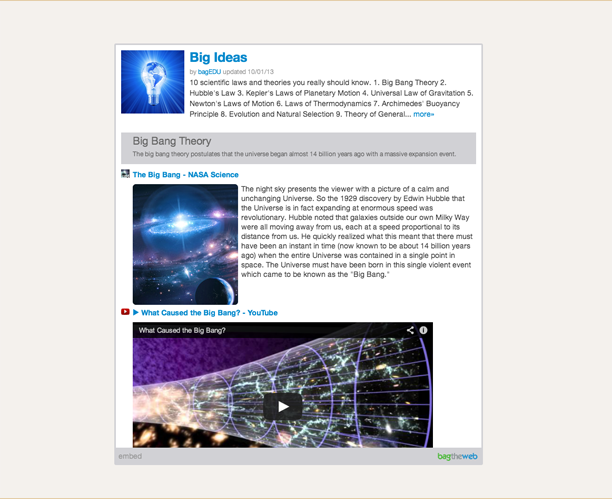 Regardless if you want to embed into your site’s sidebar or your blog post, we’ve got an embed that will work for you. See something you like? 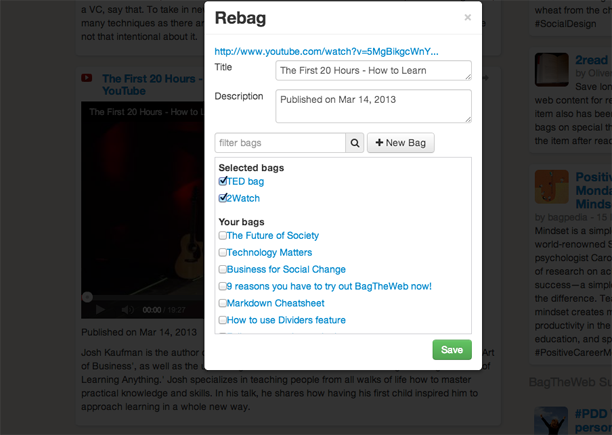 Click the “Rebag” arrow in the top left of a bagged item and add it to one of your own bags. That item will show up in your bag with a link back to the original so your readers can see where you’re finding great links. Share it or hide it. It’s up to you. You can choose to publish your bags, but you can also keep them private. Let's see how we eat own dog food and how active baggers use these two new features. Find our official accounts and team members' accounts. Follow us on Twitter, Google+, Facebook, Slideshare and Flickr.